Then remember when I didn’t do it? Thank goodness for Neil Bryer’s excellent guest strip. I think he really hit it out of the park with this one. Not only did he throw in a great callback to the dream sequence punchlines I use from time to time, but he made it as sweet and heartfelt as all get out. I’ve had the good fortune to meet Neil a couple of times while attending conventions in Chicago. He’s always very cool and polite. We talk shop for a little while and then he always let’s me get back to selling. Never intrusive. Always plays it just right. Neil has a comic of his own called Wombat Comic that I encourage all of you to check out. It’s obvious to me that Neil put a lot of thought into his guest strip and I think you guys should reward him for that with a few clicks, don’t you? Need proof that Neil put a lot of thought into his comic, check out his commentary, which he included with the image file he sent to me! I’ve known Tom and “Theater Hopper for a few years now. I was late to the show, sure, but I quickly became a fan and jumped on each new strip as they were posted. So when Tom announced a few months ago that he was ending the strip, it of course made me sad. I mean…it’s one less webcomic for me to compete with, so sure, I wasn’t too sad…but still. You know? Anyway, when Tom said he was accepting submissions for guest strips, I knew I had to jump on this. It took me a while to come up with a concept that fit both the current storyline and stayed true to the tone of the strip overall, but hopefully I’ve managed to do just that. So without further ado, I present “The Dream”. Panel 1: Why does Jared have a beard?…and a wife?…AND KIDS? Oh, it must be some time in the future. That would also explain why Tom has a receding hair line, a bit of a gut, and looks just generally worn out. I imagine this is taking place about 10 years out from where we are right now. Panel 2: Henry and Pearl are the names of Tom’s real life children. 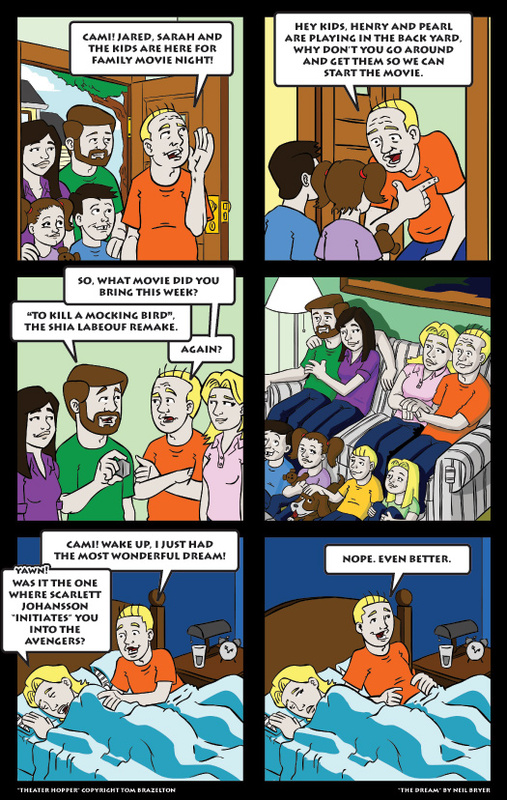 I figured since the characters in the strip are based on Tom and his wife, then his kids should also be based on reality. I asked Tom if it was cool to include their names and he said it was alright. Panel 3: In 2016, right on the heels of the highly successful “Jones 5: The Adventures of Mutt”, Shia was tapped to play Atticus Finch in a remake of the classic film “To Kill a Mockingbird”. To the surprise of everyone, this instantly became Jared’s favorite movie. Also, in the future, movies are shown on little metal cubes (Actually, the cube is just the player. The files are stored on tiny crystals, but they’re so small that they often get lost when you try to transport them, so most people just bring the whole player along with them when they go anywhere). Panel 4: Why the heck did I put so many characters in this story?! By the time I was done drawing in the kids, my hand was ready to fall off. Panel 5: The reveal, it was all just a dream. I guess Tom is more ready to start a family than even he realized. And, of course, who hasn’t had the Scarlett Johansson “initiation” dream? Panel 6: Cami has good reason for the look of concern on her face…I mean, better than the Scarlett Johansson dream? Her mind reels with the possibilities. Well, I hope you enjoyed this flight of fancy of mine. It was fun to play in someone else’s sandbox for a bit, but I should get back to work on my own comic (http://www.wombatcomic.com (shameless self promotion)). Pleasant dreams! Thanks, Neil. I loved this comic! Incidentally, I think I figured out a simple solution to the content problem I’ve been experiencing lately. Certainly there’s a bit of foot-dragging going on at a subconscious level. I don’t want the comic to end! But, also, I’m making the production of the comic MUCH harder than I need to. I have it in my head that if I’m going out, I want to go out with a bang. So I’m trying to make each comic as good as possible before I post it – and it’s causing delays. Then I remember something one of my art teachers told me: “Stop fussing with it.” Sometimes, you just gotta let these things go, you know? The thought occurred to me when I was putting together this week’s comic. In an effort to give you “more,” I was setting myself up for an 8 panel comic. Then I realized, “This could easily be split into two comics.” Problem solved! I work faster, suffer less burn out and you get two comics this week instead of one. So that’s the goal. Be on the lookout for two comics this week starting tomorrow. Thanks again for your patience as I cross the finish line with the comic.